Dungannon driver Kris Meeke will remain with Citroen for 2015 after impressing in his first full season in the World Rally Championship. The 35-year-old secured four podium finishes this year and helped Citroen to the runners-up spot in the manufacturers' championship. Meeke will continue to race in the DS3 WRC alongside co-driver Paul Nagle. 'It's fantastic to to continue to work together. 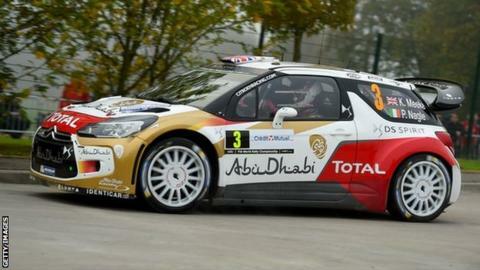 Citroën have given me the chance to prove my worth," said Meeke. He added: "This first full season has been spent learning about the WRC. "In the second half of the year, I was able to show part of my potential. There's room for improvement, but I now have some decent foundations to build on next year, in order to keep progressing. "With experience, everything becomes that bit easier. I know the team well and we understand each other. I feel like I'm part of the Citroën family!" Citroen Racing principal Yves Matton is delighted to have Meeke behind the wheel for the 2015 campaign. "When we chose Kris Meeke for this season, we took a bit of a gamble," he said. "But he has improved with pretty much every race and has now become a complete driver. "Kris is a competitive driver on all surfaces, capable of being quick on tarmac and on gravel."